Why Explore Types of Dominance with Dog Handling? Thank you, Brad, and to everyone for the wonderful comments. Wonderful exploration. You all help me clarify several goals and hopes from this discussion. Visit my website for more philosophy and discussion. In my previous blog entry I described having a connection with the wild animals I work with and how I saw zoo caretakers asking their animal to cooperate with procedures such as blood collection and nail trims. This is not physically forcing an animal to do anything. There is give and take between the animal caretaker and the animal. 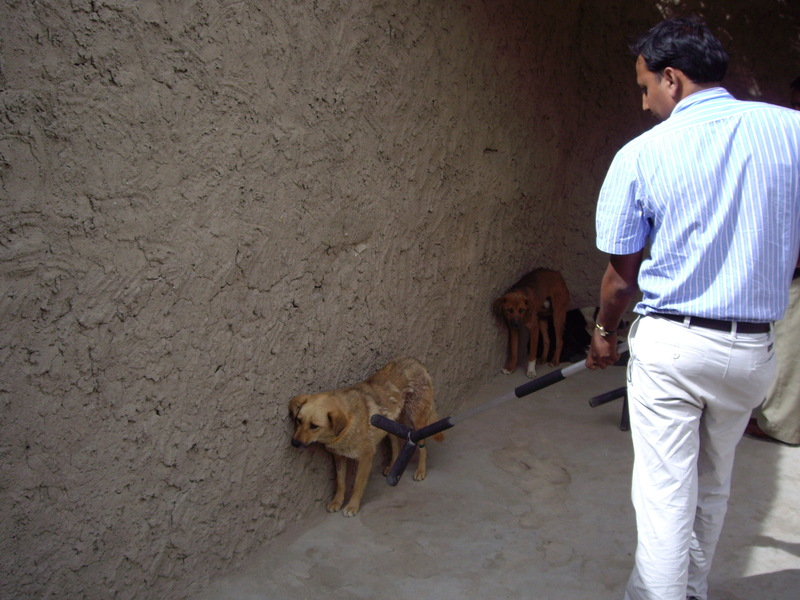 I have seen how skilled animal control officers understand and practice this with dogs. They work with the personality of that individual dog. They work with it and entice it if they can. And if the animal control officer is not sincere in his or her enticements (i.e. “I am going to catch you whether you want to be caught or not” instead of “Yes, I really want to help you by getting you off the streets”) – if the handler is not sincere, the dog will feel it and the capture may not be successful and will likely NOT be as easy or calm as it could have been. I am excited to announce that I will be teaching a two day humane feral dog handling course in Springfield, Massachusetts specifically for the animal control officer, shelter worker, and disaster responder. This is the most extensive course in handling fearful dogs. This is an essential course for professionals addressing hoarding cases, responding to disasters, handling fearful dogs in shelters, assisting with trap/neuter/release programs, and rescuing dogs in general. This course is a product of my experience handling over 2,000 feral dogs throughout the world including the Caribbean, India, tribal lands, and rescue operations after Hurricane Katrina. O Connor dog course Announcement Here are details about the course. The course is limited to 40 people. Visit our website Seminar Schedule for more information and for registering. Either register on-line or by mail. Feel free to contact me if you have any questions at mjohnson (at) wildliferesources (dot) org. Please note: I will also be teaching this humane feral dog capture course in Seattle in June, 2010. The specific dates and locations are yet to be determined. A recent news article came out about a dog hoarding case in Harney County Oregon with 50 suffering dogs. http://www.komonews.com/younews/79844302.html The struggle for me is to see the frustrations and challenges with catching these dogs in order to give them a better life. I have assisted with several hoarding cases with HSUS as well as rescuing dogs after Hurricane Katrina and appreciate the incredible challenges for the animal control officers. Too often the people are struggling to protect themselves and do not know the strategies or the tools, and it becomes a frantic and brutal fight. There are calm and humane approaches to gathering dogs such as those at Harney County. The Y pole is a great tool if calmness and compassion is an inherent part of it. The Y pole simply used as a physical stick, however, will not be effective. I cannot afford to volunteer with these situations, but it motivates me to create more on my website and with a training video. If you are interested in helping me create these valuable resources for the animal shelters and control officers please contact me. Also, I value your comments about what Global Wildlife Resources can provide to meet your needs for handling feral dogs. Please let us know. I sincerely wish for a safe, calm, and successful gathering for the animal welfare workers in Harney County. To learn about the Y pole, how to use them, and how to make them visit our Free Training Library and Y Pole Page.